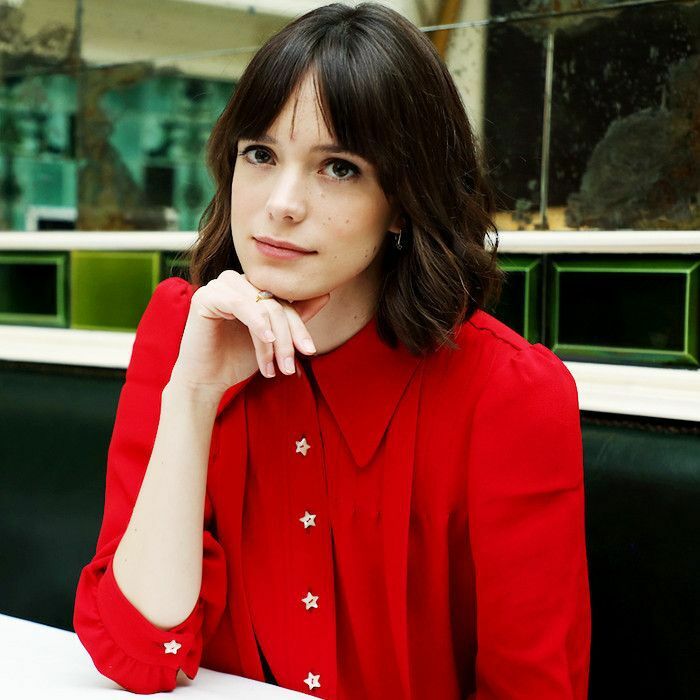 When I met up with French actress and Miu Miu ambassador Stacy Martin to talk all things beauty, I didn't expect we'd be swapping tips with one another. Typically when I interview a celebrity, I sit back, nod my head, and add a response here and there (or occasionally blurt out something I think is funny and hope for the best), but this was very much a volley of sorts. She even asked me for product advice at one point (whaaaat?). Perhaps it's her French-girl nature; Martin embodies all the aspects of being a chic French influencer in Hollywood: She's stylish, she's forthright in her answers, and she's a minimalist. So much in regards to the latter that she shrugs off questions about her haircare routine (she's never once dyed it!) and her makeup application. One thing she's a bit more invested in both product- and time-wise: skincare. Keep scrolling to learn all of her secrets. This isn't Martin's first rodeo: She's been a spokesperson for Miu Miu fragrance before and has teamed up with them again for their new fragrance, L'Eau Bleue ($90). I ask Martin how life has changed for her in the time between the campaigns. "It's been two years, and I had just started working, so I had done my first film, and then I started working with them, and since then, I've been able to shape my career a bit more and see where I want to go. I didn't assume that when you do a fashion campaign that it can continue on a long-term basis, and that ideal really appealed to me because it's a world I really enjoy being a part of. I really enjoy what [Miu Miu does]—it's very beautiful, it's classic, but it's also fun and feminine and strong, so all of that was part of my decision [to work with them again], and it was sort of obvious. In this particular fragrance, I love the lily of the valley and the fact that it still has akigalawood—I think that sort of grounds it a bit more so it has lots of undertones—it's really fresh and very spring-y." Staring at her milky complexion, I knew I had to dive right into her routine. I needed to know all the contents, stat. "It's very simple," she says. "I'm super simple and super lazy. I use the Kiehl's Calendula Face Wash ($29)—I keep saying 'arugula,' but that's lettuce [laughs]. Then I use the Bioderma micellar water ($20) and then Eau Précieuse ($14), which is a French toner, and the Kiehl's Oil-Free Moisturizer ($28)." Hey, some people only use one skincare product, so I wouldn't exactly classify Maritn as "lazy." I then press her on her makeup routine, but, much to my dismay, it's indeed super simple. "It's just foundation and mascara," she tells me. I spot a set of perfect, razor-sharp cat eyes drawn onto her lids and call her bluff. "And the liner of course, right?" I ask. "Oh, I didn’t do this," she insists, shaking her head. "I tried to do liner once and it took half an hour and it was horrible, so I let other people do it." Fair enough. I tell her that I feel that deep, black liner is a quintessential French-girl staple and ask her if it's just a stereotype we Americans believe to be true. "No, it is. You can just do the liner, and then that’s the look. If you do some of the more established makeup, there's a lot more to do, so I think the eyeliner is the simplicity of it. You see a lot of girls on the train in France just going pfft, pfft [makes eyeliner gestures] and you’re like, Wow! I see you've got some eyeliner on," she says to me, knowing full well I don't have a makeup team doing my look each day. "I use one of the markers [Ed note: Nars Eyeliner Stylo, $28], so I think that makes it easier," I reply. "Hm, I'll have to try that!" she laughs. Imagine that. I'm teaching a beautiful French actress a makeup tip. I then ask her for a trade: Which French products should I (and other American girls) be using? Again, she lists off her favorite toner. "Eau Précieuse. I really like it. It’s really old school. It's not really… It's the kind of thing that people say, Oh, isn't that what old people use? But I've always used it, and it's become sort of normal in a way for me to have it—even just the smell of it and the texture and just the way it feels on my skin. But apart from that, I find that all the good French products sort of travel everywhere. I mean just the fact that the Bioderma micellar water is so well-known…"
As for her favorite American products? She's actually not too familiar. "I don't know if it's American because she's not American, but I do love the Tracie Martyn Enzyme Exfoliant ($90) and that’s amazing. It’s the best one I've used so far." She ponders a bit for some more products but appears stumped. "Do you have any recommendations?" "When I think quintessentially American products, I think of CoverGirl and Maybelline, but they're more worldwide giants," I tell her. "I don't think you can buy CoverGirl in France? [Ed note: You can.] I haven't lived there in so long, so I might be also completely out of touch." I ask her if she uses these mainstream drugstore brands. "Yeah," she replies, "because if you run out of something, then you just go. I find the mascara is quite good—the Maybelline… It's in a pink bottle? It's a really good one in a pink bottle with a green cap." "Great Lash ($4)!" I explain, somewhat proud of my product recognition abilities. "Yes. That one’s really good. I always use that one. And I also go to MAC because there seems to be a MAC everywhere." "What about your haircare routine?" I ask, hoping her chic mane isn't attributed to just good genes. "I just wash it," she whispers. Drat. "I'm even lazy because I cut it so that I wouldn't have to do anything to it. I just make sure I use good shampoo. And I've never dyed it, so it's kind of easy to just take care of." However, she's no stranger to dry shampoo. "I have bangs, so you have to have dry shampoo," she says. "It's always in my bag." Finally, I ask her what the secret is to being effortless. Aside from good genes, aside from being "lazy"—what's the key? "Confidence and comfort," she explains. "Just being okay with who you are or where you are. Because you can do so much makeup or styling, but I think, ultimately, if it doesn't come from you, you're never going to be happy because you'll always see something different than what's in front of you." Which begs one more question. "Are you confident with where you are now?" I ask. She ponders this a moment, quizzically. "Ummm… yeah. I mean, I'm excited, and I try and work really hard to be in a space where I work in the capacity that I want to because the more you do that, the more you'll do that in the future. So I'm trying to find that balance between working in an industry that demands a lot— where you always have to be available—and just being me. But that gives me confidence, to see that people enjoy the work I do and that you enjoy doing these types of interviews, and you kind of see where you're at through other people. 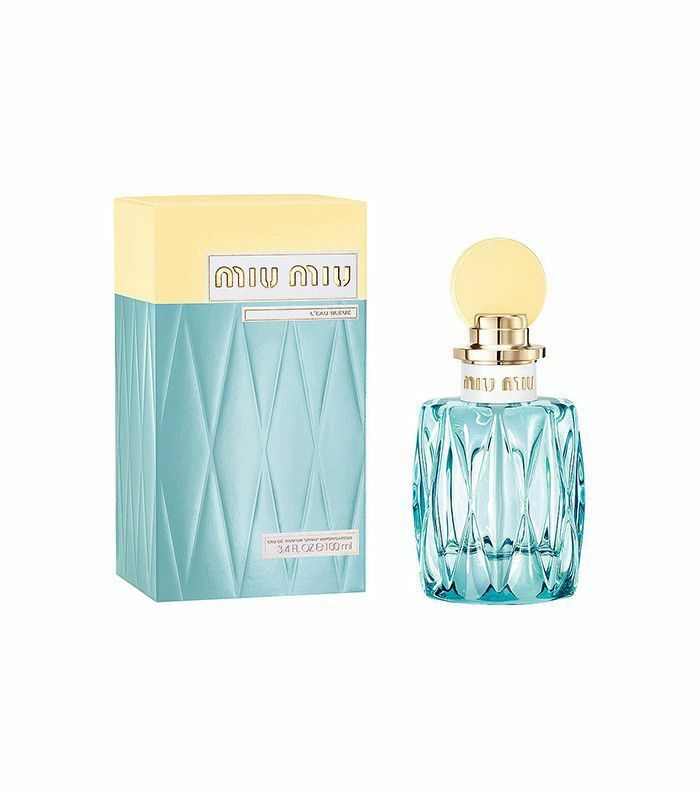 Transport yourself to springtime in France with Miu Miu's fresh new fragrance, served up in their iconic blue bottle (but this time, in the form of glittering, transparent glass) available now. For more French beauty tips, check out the eight beauty secrets only French girls know.